SPELAB with mobile rack is designed specially for modern laboratory. 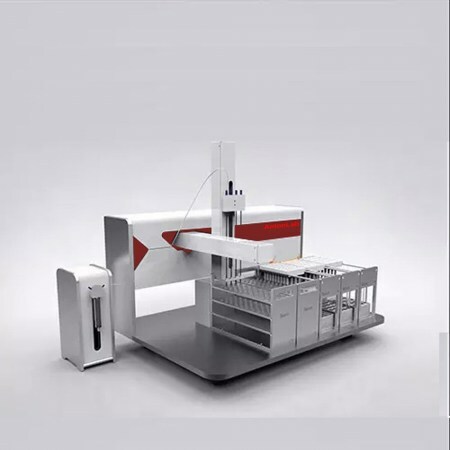 It has large cartridge capacities with full automation and can extract, separate and purify trace organics from food, medicines, beverage, soil, water, blood..., sample preparation system for GC, HPLC or MS.. Powerful software workstation: graphical interface minimizes the learning curve while maximizing efficiency. The application run screen provides complete control over your run; from set up to application run, to simulation and the modification of your method. Provide powerful auto-detection function, automatically detect any wrong about the method and setting. Provide user account control. It’s according with GLP/GMP. Cartridges capacity up to 108 pcs, improve rapidly production. Modify your own method meet your different experiment requirement. Probe level track function, probe track the liquid level and low down, decrease the touching part with the sample, avoid crosscontamination from other sample or solution. Collect multi-component with the same SPE cartridge. Solution monitor, software can show the volume in real time. Leakage warning. Metered volume module is optional, realize metered volume accuracy. Pressure overload protection, Syringe Pumps are equipped with pressure sensing modules that monitor pressure and can be used to handle error conditions such as high cartridge pressure or clogged liquid lines. High precision locating, accuracy up to ±0.01mm.